Rick Robinson was settling into his new job as the college baseball coach at Tennessee-Martin, moving some things around his office when he came across a few articles that had been written about the previous year's team. 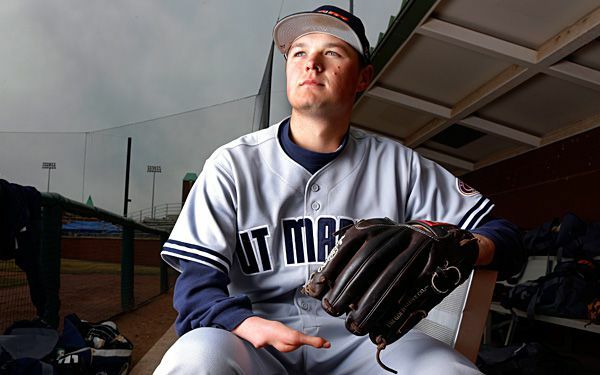 Now, Carter Smith is turning into one of the best pitchers in the Ohio Valley Conference. 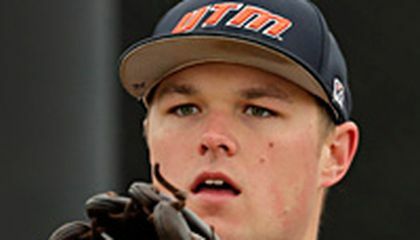 The 6-foot-2 left-handed senior has been solid for the Skyhawks, leading the conference with a 2.03 ERA in 31 innings while striking out 29. An ERA is the average number of runs a pitcher gives up every nine innings. Smith's system is similar to that of former Major League Baseball pitcher Jim Abbott, who was also born without a right hand. He played 10 seasons in the big leagues, winning 87 games and even throwing a no-hitter. Smith said his dad took him to Busch Stadium to watch Abbott pitch in the 1990s and it helped reinforce that having only one hand didn't have to stop him from playing baseball. There have been a few adjustments in college like learning to hide the ball a little better during his windup and delivery so batters can't pick up the pitch from his grip but for the most part his system has stayed the same since he was 6 years old. "It's never bothered me," Smith said. "I just look at it as a free out." Robinson said Smith keeps opposing batters off-balance despite a fastball that tops out between 86 and 88 miles per hour. Instead of pure velocity, he relies on good command, a slider and a deceptive change-up. Smith hopes his career can continue at the professional level next year. But if it doesn't, he's well prepared. He's majoring in sport management and has made the OVC Commissioner's Honor Roll the past three seasons. Critical thinking challenge: How can you participate in professional sports without being a player? I think this is very cool and inspiring that even with one hand he can participate in baseball. I'm also glad he is dedicated to play. I think that this boy, Carter Smith, is amazing. He only has one hand and is still rising to be one of the best pitchers in his area. I would want to see this boy pitch in a game. I wonder what his style of play is and how he performs with just one arm. Why do people judge other people on how they look. Good thing that the baseball pitcher got to do what he wanted to do and had a chance to play because not everyone that looks different or something is wrong with them since they were born do get to do what they want to do. This is truly very inspiring, and I now look up to this man very much! I send my best wishes to him and his college baseball career. This article is really inspiring and I enjoyed reading about it. After reading this article the motivation of Carter Smith has inspired me to never give up and to strive to be the best I can be. Carter Smith had a huge disadvantage in the game but he persevered through it and became one of the best pitchers on the field. His determination and endless practice should be proof to everyone that if you have a goal and you work to achieve it you can do anything. this is very inspring it proves that anything is possible and if you believe in your dreams they will come true.he is very determined no matter what he will still do what he loves to do . this is very cool that there is a baseball player that only has one hand pitching cause I never heard or seen anything like that but I hope he gets some were in live with that.